The 40-year-old from London was rearrested over the disappearance of the midwifery student. He was previously held and released earlier this month. Ms Morgan, of Hatfield, Hertfordshire, was last seen at a church celebration in Ilford, London, on 26 December. She failed to return to Hertfordshire University in the new year. Ms Morgan, 21, was reported missing on 7 February. 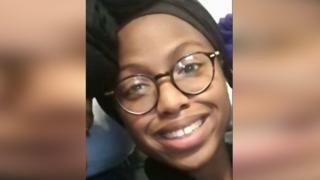 She has not used bank cards, withdrawn money from her account, made any mobile phone calls or used social media since she disappeared, police said. Her disappearance is so out of character they now have very real concerns for her, a spokesman added. In a video released last week, her mother Carol Morgan told how the family had been left "broken" by her disappearance. Det Ch Sup Karena said: "We need to consider the context in which Joy has gone missing, and given the sudden nature of her disappearance, and the non-contact with her friends, family or fellow worshippers at her church, at this stage we have to consider that she may have come to harm." She has links to Ilford, Battersea, Cricklewood, Stevenage and Luton. Police are keen to trace information around a highly distinctive Honda that Joy regularly travels in.